The 1847 CLASSIC is now available in super-low tunings, redesigned to include a 20% thicker comb and raised coverplates. Available keys range from LF# (low F sharp) down to LLE (double-low E). This innovation expands our 1847 line of Stainless Steel reed harmonicas to include the extreme bass range. 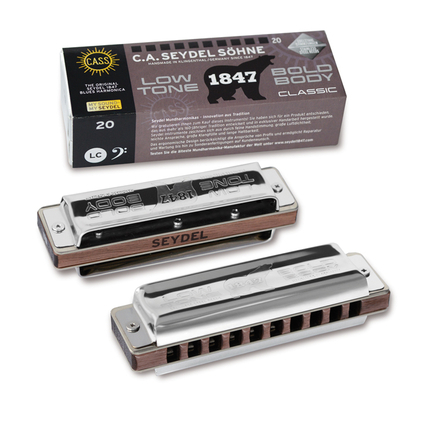 The double-low models (LL) are tuned two octaves lower than standard, makingSEYDEL’s 1847 LLE the lowest tuned diatonic harmonica worldwide. 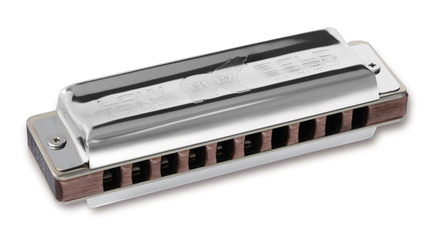 In comparison to the 'standard tuned' models, low-tuned harmonicas offer a very sonoric, slightly softer and unobtrusive sound making them an excellent choice for accompaniment (chords or bass lines) as well as for soloing. Their sound is similar to that of a tenor saxophone, a trombone, or even a tuba, especially if played amplified. This considerably extends the range of application and opens many new possibilities for harmonica players. To get the desired sound out of the low-tuned models the notes need more space. The resonance chamber, increased by the 20% thicker comb (sealed walnut) and the higher coverplates of the new 1847 Low models, help to produce a fatter and louder sound.